Nothing says summer—to me—quite like swapping my steamy cup of coffee for a frosty iced or frozen version. But as a registered dietitian and the nutrition editor of EatingWell Magazine, I can’t help but wonder what the calorie damage is on some of those iced coffee or frozen coffee drinks, especially at popular restaurants like McDonald’s, Starbucks and Dunkin’ Donuts. Milkshake-thick coffee goodness + whipped cream + chocolate drizzle = diet derailer. I investigated—below is a look at how 16-ounce frozen coffee drinks stack up nutritionally at three of the most popular fast food restaurants—McDonald’s, Starbucks and Dunkin’ Donuts—plus some tips on how to order healthier sips. The Healthiest Choice: As a nutritionist, I’d be remiss not to mention this: ordering the iced coffee (mocha) version of each of these drinks can cut the calorie load significantly—in some shops by as much as half. Also, a straight-up iced coffee (with skim milk, which you might have to specify) is, of course, the skinniest sip—most of the 16-ounce varieties deliver less than 100 calories. 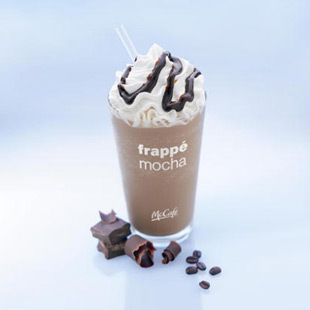 The Worst of the Bunch: McDonald’s Frappe Mocha (medium, 16 ounces) delivers 560 calories, 24 g fat, a day’s worth of saturated fat (15 g), 70 g sugar, 160 mg sodium. I was surprised to learn that it's comparable nutrition-wise to a Big Mac—which has 540 calories, 29 g fat, 10 g saturated fat, 9 g sugar, 1,040 mg sodium. How to Order a Healthier McDonald’s Frozen Coffee Drink: Skip the whipped cream and chocolate drizzle and you’ll save 90 calories, 7 g fat and 4 g saturated fat, plus a little sugar and sodium. Save even more with a small: it’s 12 ounces and has 450 calories, 20 g fat, 13 g saturated, 56 g sugar, 130 mg sodium. 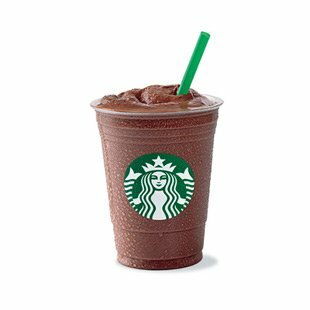 Starbucks Mocha Frappuccino (Grande, 16 ounces) delivers 360 calories, 14 g fat, 9 g saturated fat, 54 g sugar, 210 mg sodium. How to Order a Healthier Starbucks Frozen Coffee Drink: Order it without whipped cream and swap Starbucks standard 2% milk for skim and save 130 calories, 13 g fat and some sugar and sodium and nix all the saturated fat. The Mocha Light Frappuccino (Grande, 16 ounces) is even, well, lighter: 140 calories, 1 g fat, 0 g saturated fat, 29 g sugar, 190 mg sodium. Dunkin’ Donuts Coffee Coolata (small, 16 ounces) delivers 240 calories, 4 g fat, 2.5 g saturated fat, 49 g sugar, 90 mg sodium. How to Order a Healthier Dunkin’ Donuts Frozen Coffee Drink: Ask for it with skim milk instead of whole and you’ll save 30 calories and ditch the total fat and saturated fat altogether. What's your favorite iced coffee or frozen coffee drink—and how do you order it so it's lighter?